Get In Their Face. Get Opened. Get A Response. That's the credo of every good direct mail piece. I like to think of myself as a drill sergeant, driving these three points home to every direct mail piece I train. Why, I have hundreds out there on the front lines right now. I'm proud of those boys. The Assignment: Keep John Myers' name and talent top of mind with ad agencies, designers and marketing professionals. The Answer: Create e-blasts and 3-D direct mailer that showcase John’s amazing images and his ability to capture the essence of human character in every one. And, yeah, the butterfly mailer won an Addy. The Assignment: Collect valid email addresses from alumni who’s addresses have changed or who never provided one. The Answer: Send a postcard reminding graduates the social, networking and, most importantly, gossiping opportunities they're missing by not staying connected to their alma mater. The Assignment: Showcase the speed, flexibility, quality and cost-saving potential of the Xerox 6622 Wide Format Solution. The Answer: Put something in printer’s mailboxes that screams Wide Format performance. The Assignment: Let disengaged customers know that Kodak wants to stay connected but respects them enough to go away if that’s what they prefer. The Answer: Send a final e-blast from a jilted lover and tie in the motion picture industry at the same time. The Answer: Use pride, school spirit and good old-fashioned logic to deliver the message. And throw in some fun personalization and QR codes. The Assignment: Get the community to save the date for the annual Fire and Ice Auction and announce the theme. The Answer: Print the post card on heavy enough stock that the center can pop-out and be worn. Wearable art is very hard to ignore. 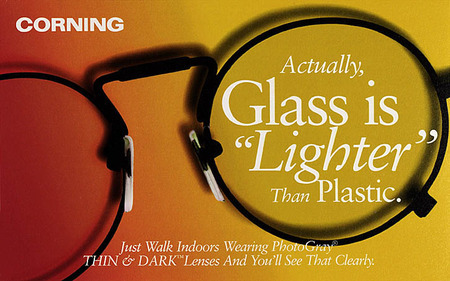 The Assignment: Convince doctors that the light/dark performance of glass lenses "outweigh" lighter plastic lenses in terms of benefits. The Assignment: Convince a leader in corporate outsourcing to add a line of self-paced training guides to their service portfolio. The Answer: Produce a radical direct mail piece including Frank Sinatra's Duets Compact Disk and custom album insert highlighting how these two corporations could make "beautiful music together." The Assignment: Promote a new "fee-for-service" web site to all consumers scanners, film recorders and digital cameras before they create the site. 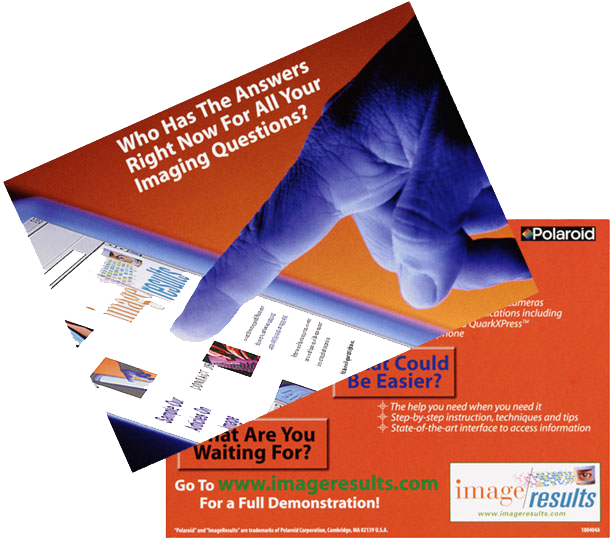 The Answer: Create a free standing "In Box" insert for every Polaroid digital product package for the length of the program that highlighted the advantages of the ImageResults site, teased the look and demonstrated the ease of use on a launch landing page.